Beijing-The end of the adventure | the best is yet to come. Our last day in Beijing was supposed to be Monday the 1st of July. It started off with a journey to the Great Wall of China. I have to say that I never imagined seeing it in my life. I never really thought I would ever go to China because I always want to go to Europe (I know typical, right?). When we arrived at the wall I was a bit disappointed because the weather was not cooperating. The pollution was pretty bad. Consequently the smog was terrible. We could only see a small section of the wall instead of the wall stretching out into the distance. One of the first things we noticed when we arrived were a few souvenir stands. 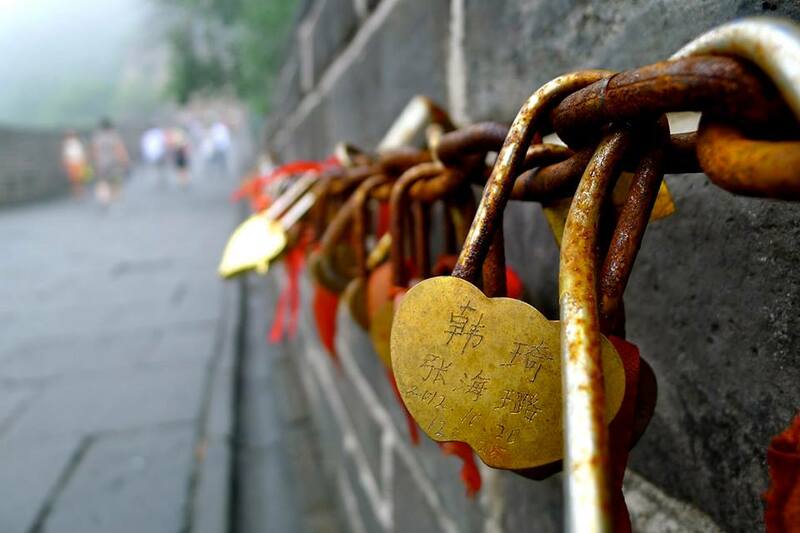 We noticed one man was selling locks that he engraved to put on the wall. Lauren and I shared a lock and he put our names and the date on it. We have pictures commemorating the moment we attached it to the chain on the wall! Not only was the smog bad but it also decided to rain a little bit when we got to the top of one of the mountains. The hike was pretty challenging for me. I am not in horrible shape but I definitely don’t exercise everyday. I had to stop a few times to catch my breath as I ascended higher up the wall. Luckily we didn’t hike too far so it was still enjoyable. I am so happy that I was there! Because of the poor visibility I now have an excuse to go back to Beijing! Heading back to our hotel we stopped to take a tour of the jade museum. The workers at the museum told us how to spot high quality jade and most of us ended up buying a few gifts at the end. I invested in a nice jade bangle and a small gift for my parents. From the museum we continued to drive back to the city and straight to Olympic Park where the 2008 Olympics were held. 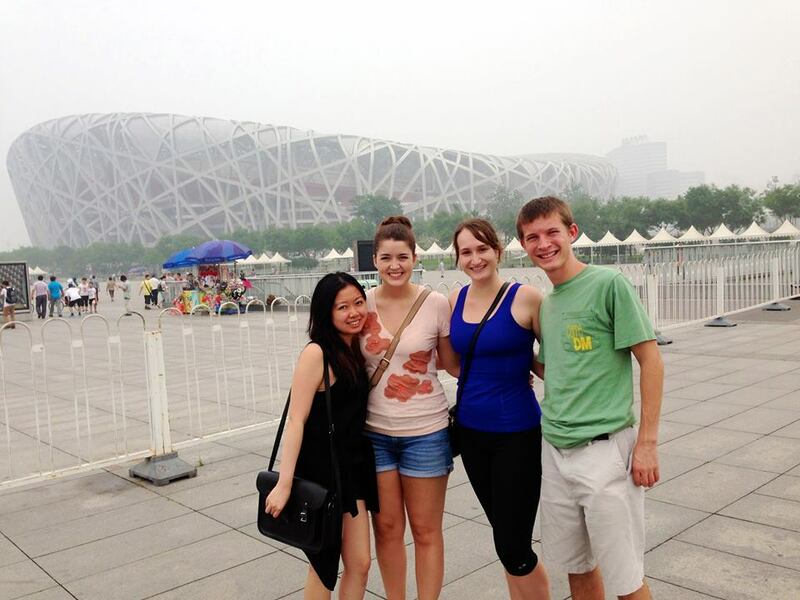 It was surreal standing next to the Bird’s Nest and the Cube (where Phelps won a ton of gold medals for swimming!). It was a sight to behold and many people were walking around the area taking it all in like us. I guess the Cube has been converted into a swimming park, which is pretty awesome! After Olympic Park we went back to the hotel to get our bags and head to the airport. Unfortunately, we weren’t so lucky because there was a monsoon in Hong Kong that delayed our flight. Apparently, our airplane hadn’t even left Hong Kong! We weren’t allowed to check in to our flight so we stood in line waiting for instructions. Eventually the airline made some moves and gave us all free vouchers for dinner. We were satisfied with the compensation at first until we reached the restaurant and were turned away because they were full. So we wandered to a different restaurant that wasn’t as good. We didn’t get to choose our meal so we had to make do and just be content that we got food at all. After dinner we went back to the check-in counter at 8pm. The airline told us our flight still hadn’t left Hong Kong and they didn’t know when we would be able to fly there. So they sent us to the Crowne Plaza Hotel for the night. We ended up with a free room at the Plaza, which was amazing. We all freshened up the best we could and crashed for the night not knowing when our flight would be to Hong Kong. In the morning we got a complimentary buffet breakfast! It was pretty good! The airline came to pick us up at 11am to take us to the airport. We were all on the bus when my friend Stephanie realized she forgot her phone in the lobby of the hotel. So we had to split up so she could go retrieve it. Landon, Lauren and I waited for her at the airport before security so we could all check-in together. (FYI Andrew missed all this by flying home on Monday. Lucky duck!) We got on the plane at 1:30 and were set to depart at 2pm. Well that didn’t happen. We were in line to take off when we were notified that an accident had occurred on the runway. So landings and takeoffs were all backed up. We didn’t fly out of Beijing until 6pm! We finally arrived in Hong Kong at 9pm Tuesday night…22 hours later than we were supposed to! We got back to our housing (City University of HK) at 11:30pm. It felt great to be back in Hong Kong. It felt like home to us after being away for just short time. I can only imagine how great it will feel once I am back in the U.S. in a few weeks!